Provide your Television with sharper images using Computer Cable Store™ high performance 100 FT S-Video (S-VHS) Cable - MiniDin4 M/M. S-Video is able to surpass composite video quality in that it sends signals to the TV in the same format that the TV processes them, in two separate signals for color (chrominance) and brightness (luminance). 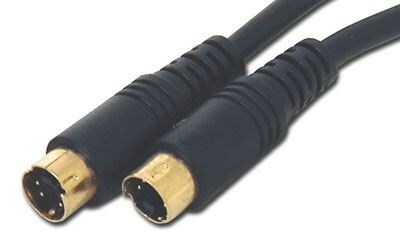 These Male MiniDin4 cables are 100% shielded to prevent EMI/RFI interference. Designed for use with DVD players, Digital Satellite, Game Consoles, etc.